The Asus P5B Deluxe/WiFi-AP has two PCI Express x16 slot for videocards, one PCI-e x1 for high bandwidth devices, and three 32-bit PCI expansion slots. There is plenty of space between the PCI Express x16 slots so videocards with dual slot coolers can be used without issue. Looking at the bottom right hand corner of the Asus P5B Deluxe/WiFi-AP we find one IDE connector, a pair of blue USB2.0 headers, one red IEEE 1394a header, six Serial ATA II channels and the front panel I/O connectors. RAID 0/1/5/10 comes care of the Intel ICH8R southbridge. The eSATA jack at the rear of the board counts as the eighth SATA port on this board. The JMicron IDE and SATA II port can also support RAID 1/0/JBOD between themselves. The Asus logo in the PCB is illuminated with a couple of LEDs set on the underside of the motherboard for visual effect. 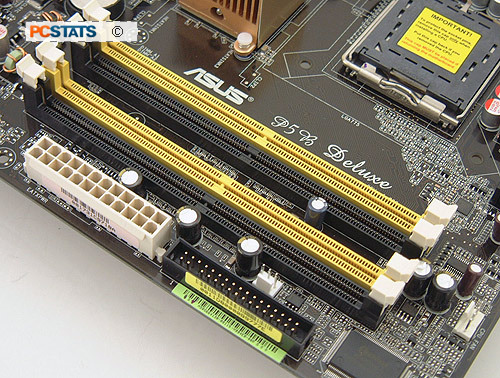 The Asus P5B Deluxe/WiFi-AP has four 240-pin DDR-2 memory DIMM slots which support up to 8GB of DDR-2 800/667/533 RAM. Populate the DIMM slots of the same colour first for dual channel memory. 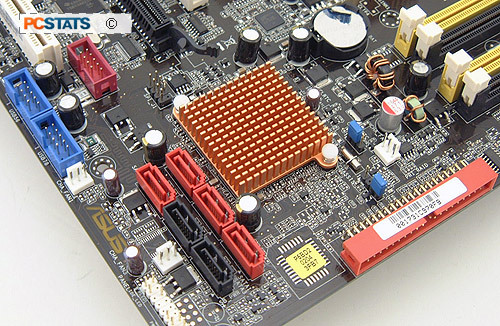 The board is backwards compatible with legacy 20 pin ATX power supplies, but it's recommended to use at least a 500W PSU which has a 24-pin power connector and 8-pin EPS-12V connector if multiple PCI Express videocards will be used. 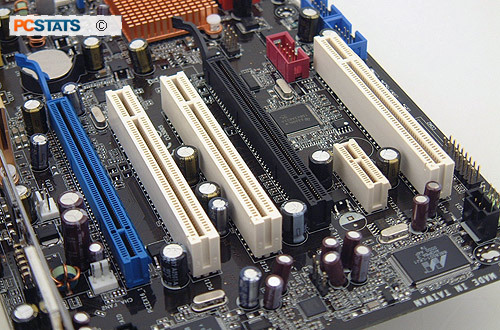 The floppy and 24-pin ATX power connectors are placed along the edge of the board, which is a very accessible location. 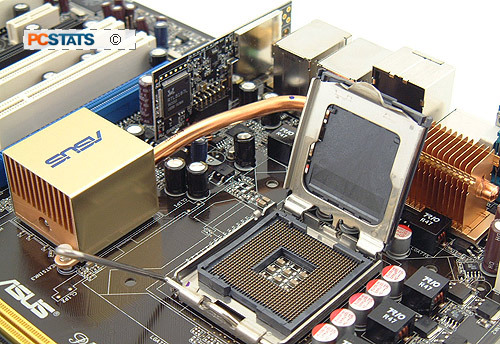 There is plenty of space around the Socket 775 so you can install large Intel aftermarket heatsinks. The Intel P965 Express Northbridge generates a fair amount of heat, which is why the heat is then transferred to the thin fin copper heatsink alongside the CPU. A 4-pin PWM fan header supplies power to PWM compliant CPU heatsink fans. The Intel P965 Express supports processors running on a 1066/800/667/533MHz front side bus. The Asus Q-Connector makes connecting front panel I/O, USB or IEEE 1394 headers a snap.